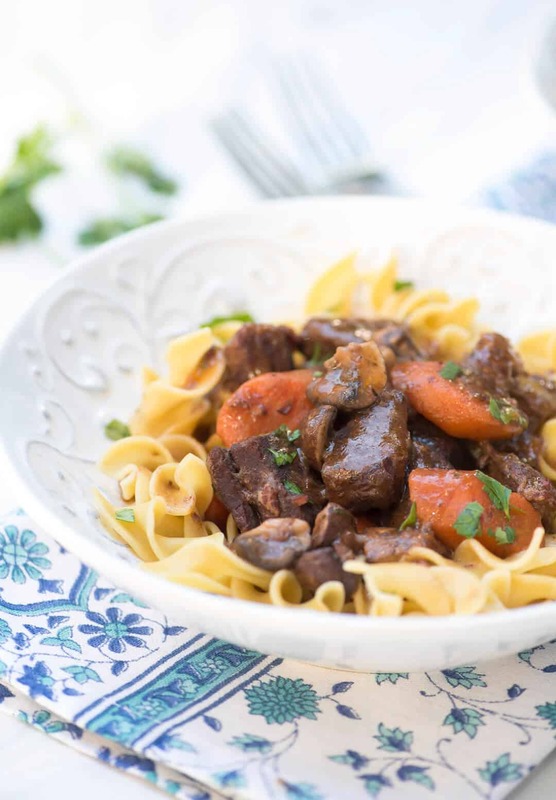 Your Instant Pot will help you create this luscious dish in a fraction of the time it would take using traditional methods. 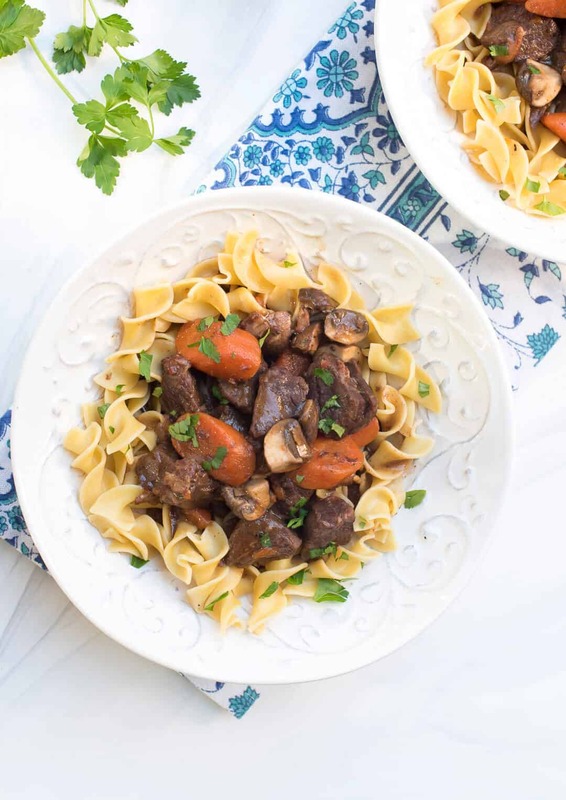 Instant Pot Beef Burgundy is rustic, flavorful and sure to impress. I’m officially in love with my Instant Pot. This incredible recipe has sealed that deal. 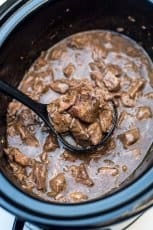 I’ve used it about twice a week since I took the plunge last month and I’ve had such awesome success with several recipes but this Beef Burgundy! It is literally swoon-worthy. 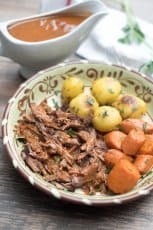 At first bite I knew it had to be the first Instant Pot dinner idea I shared with you all. 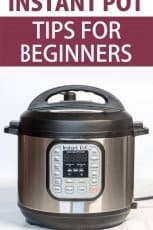 In case you missed it, I also did some delicious Instant Pot Mexican Pinto Beans a couple of weeks ago and a basic how-to post – Instant Pot Tips for Beginners – that you should definitely check out if you are new to this appliance. 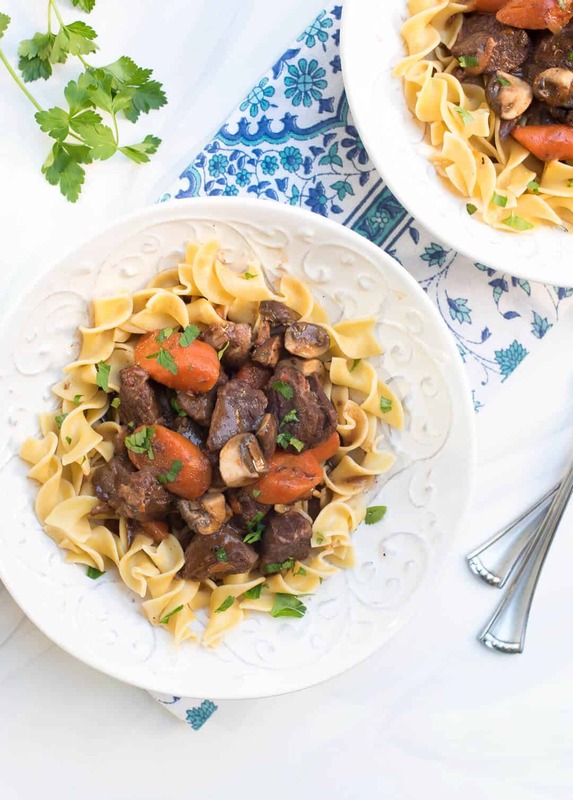 In addition to being a fabulous dinner choice, this recipe is a great way to get to know the capabilities of your Instant Pot. You’ll have the opportunity to use the Sauté function at different heat levels to sear the meat and veggies and the Pressure Cook function will get those chunks of beef and veggies fork tender. Back on Sauté, the luscious sauce is thickened with a butter/flour mixture at the end of the pressure cooking time. This is also when you’ll add quartered mushrooms ensuring they will be the perfect texture. 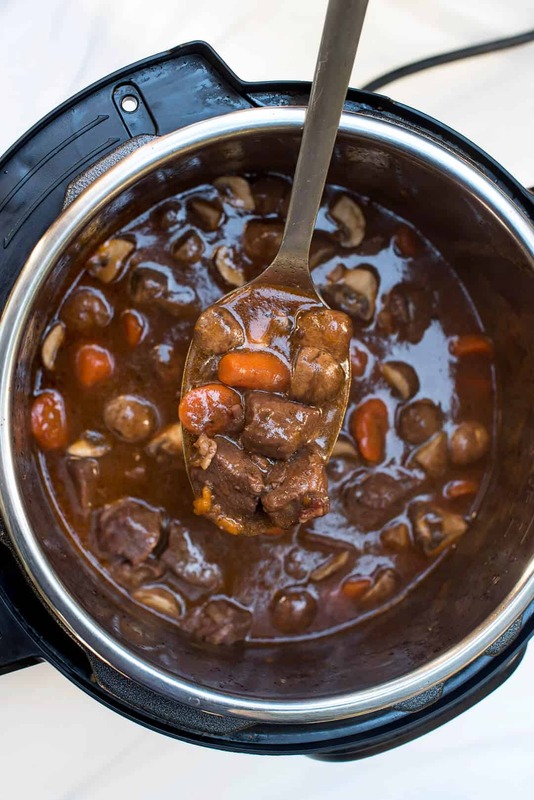 Timing is everything and adding softer items at the end is crucial with both slow cooker and Instant Pot methods. Since the Instant Pot is a new appliance for many of you, I’ve included a lot of detailed instruction in the recipe to help guide you through each step. It’s wonderful served over mashed potatoes or rice but I went with egg noodles. Classic. A couple of ingredient notes. Most recipes you’ll see for Beef Burgundy will call for chuck roast, but with sirloin you’re guaranteed a tender result with less cooking time. It’s also a leaner cut than chuck so your sauce is going to be perfection without any need to skim fat. 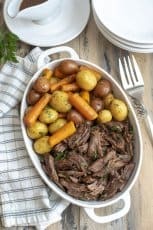 Chuck roast, or what is packaged as “beef for stew” can have a tendency to be chewy from time to time, which is why it needs to be cooked good and long. While I think that is just fine for beef stew, I far and away prefer sirloin for this dish. If you do end up using beef stew meat, I’d recommend increasing the pressure cook time from 15 minutes to 35 or 40 minutes and cutting your carrots into larger chunks so they don’t overcook at the longer cooking time. You can use either fresh or dry thyme here but dry herbs have more intensity then fresh so you’ll use less (see recipe for details). They are both wonderful choices. If you don’t have an herb garden there really is no need to go out and buy the fresh. Buy a nicer bottle of wine instead! I always have fresh parsley in my fridge and use it as a garnish to brighten up dishes like this. Not necessary, but nice. Quick tip for recipes that call for uncooked, sliced bacon, like this one. Place the bacon in the freezer while you prep the other ingredients. It will slice easily after just 5 or 10 minutes in the freezer. It smells so good while it simmers away that your neighbors might feel compelled to knock on your door to find out what’s cooking. I made it earlier today and my house is still filled with an incredible, comforting aroma that builds a serious appetite! Press the SAUTÉ key on the instant pot and the ADJUST key to select the MORE setting. Wait for the pot to say "HOT" before adding ingredients. Season beef cubes with salt and fresh ground black pepper, to taste. Add 2 tablespoons oil to the heated instant pot. Add half of the beef cubes and sauté for 3 to 5 minutes, or until nicely seared. Transfer seared beef to a plate along with all the beef drippings. Repeat with remaining oil and beef, allowing pot to return to a high temperature in between batches. Transfer second batch of seared beef along with any beef drippings to the plate and set aside. Press CANCEL and then select SAUTÉ again and ADJUST to the REGULAR setting. Add chopped bacon and cook, stirring, to scrape up any brown bits on the bottom. Sauté for about 2 minutes to render the fat. Add the onion and carrots to the instant pot and cook until onions are softened, about 3 to 4 minutes. Season with 1 teaspoon salt and 3/4 teaspoon fresh ground black pepper. Add the garlic and tomato paste and sauté for 1 more minute. Add the wine and stir to combine. Let it come to a simmer and cook for about 3 to 4 minutes, until wine is slightly reduced. Add the beef broth, thyme, bay leaves, and reserved seared beef, along with all the beef drippings, and stir to combine. Place the lid on the instant pot. Press the MANUAL button, select HIGH, and set the time to 15 minutes (making sure the steam release handle is in the "Sealing" position). After the cooking is complete, use a long handled spoon to push the steam release handle to the "Venting" position. Allow the steam to release completely and open the pot. Press CANCEL. Meanwhile, combine softened butter and flour in a small bowl. Stir the butter mixture into beef mixture in the instant pot. Add mushrooms. 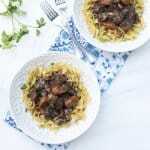 Press SAUTÉ and ADJUST to select the LOW setting and simmer all of the ingredients for about 5 minutes, or until mushrooms have softened to your liking and sauce has slightly thickened. Press CANCEL and unplug the Instant Pot. Remove bay leaves, taste, and season with additional salt and pepper, if desired. Serve over cooked rice, egg noodles, or mashed potatoes. Blot the beef dry with paper towels before cubing and seasoning. Dry beef will sear better when it hits the oil. For easy to slice bacon, place it in the freezer for 5 to 10 minutes while you prep the other ingredients. 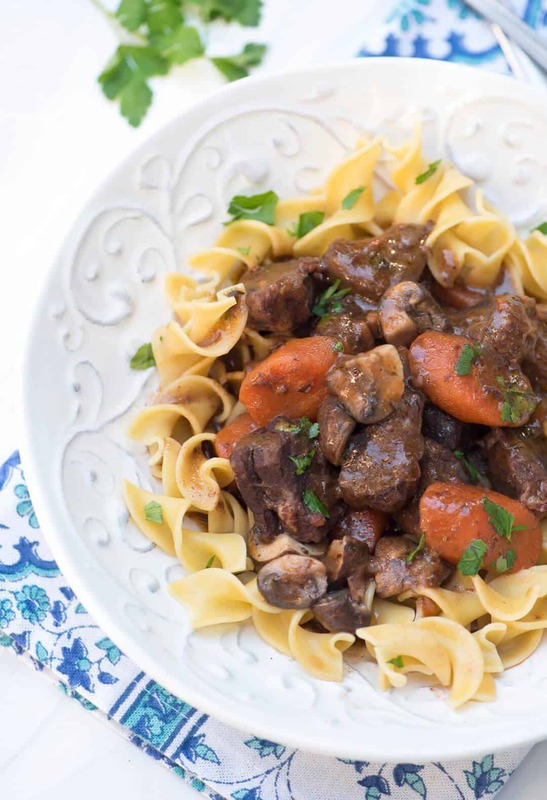 Cook time doesn't include time it takes for the Instant Pot to come to pressure which should take about 10 minutes for this recipe. Tried the beef burgundy last night. I am unable to sauté in my instant pot but turned out great. Love how quick it cooked. The note on cook time does not include the 10 minutes that it takes for pressure build up. Do you add 10 minutes to the 15 minute cook time? Hi Shelly. Follow the cook times as written in the recipe. I made that note just so people would understand that it does take time for the Instant Pot to reach pressure before the cook time will begin to count down so you need to account for that when considering how long the recipe will take to prepare. The amount of time it takes to build pressure can vary so it is not included in the prep or cook times. Needed more wine i thought for better taste and color. Otherwise came out well. Made this for me and my husband tonight. I’ve never seen him clear his plate before I’m in total shock. I also loved it. Just curious–Can you make this ahead if having company? Mmm, mmm, good. Got a new Pressure Cooker for X-mas and had left over roast beef from News Years. Couldn’t wait to try out the new pot and definitely needed to use up the roast beef. This is best stew we’ve ever had. Everything came out crisp tender and full of flavor instead of the usual crockpot flavorless mush. The butter rue at the end thickened it up just right and gave it a beautiful silky finish. May never use the crockpot ever again! This was delicious! Omitted mushrooms and served with roasted potatoes and a kale salad. I will certainly make this one again! I assume you remove the beef burgundy from the IP after pressure release in order to set the IP to saute to do the mushrooms… Or else have 2 IPs? I am anxious to try this but I guess I’ll have to do the mushrooms in a pan on the stove. Hi Christine. There’s no need to remove the beef, just add the mushrooms right into the pot with all the other ingredients and they will cook up perfectly. It might be helpful to take watch the video just above the recipe card. This looks like a really good recipe, but seems like it might not take any longer to cook it on or in the stove. If I was to cook this on the stovetop (or in the oven), how long should it simmer, and should the amount of liquid be increased 0r reduced. This recipe was specifically written and tested for the pressure cook method so I can’t say how you should change it for a stove top or oven method without further testing. Those methods would require a much longer cooking time, probably at least twice as long or even longer, in order for the meat to become fork tender. My beef burgundy recipe That I normally cook in the oven 3 hrs using sirloin beef uses golden mushroom soup & burgundy wine, onion & mushrooms. What are your suggestions using the soup. It makes a wonderful gravy. I’d love to make this for Valentine’s Day in half the time! !